The resurrection of Christ is represented as the “Rise from the Sepulcher” and “Descent into Hell”, with other scenes that have become traditional for the unfolded composition of the Resurrection from the XVII century. Around -12 stamps depicting the Passion of Christ, from the Last Supper to the Position in the Coffin. 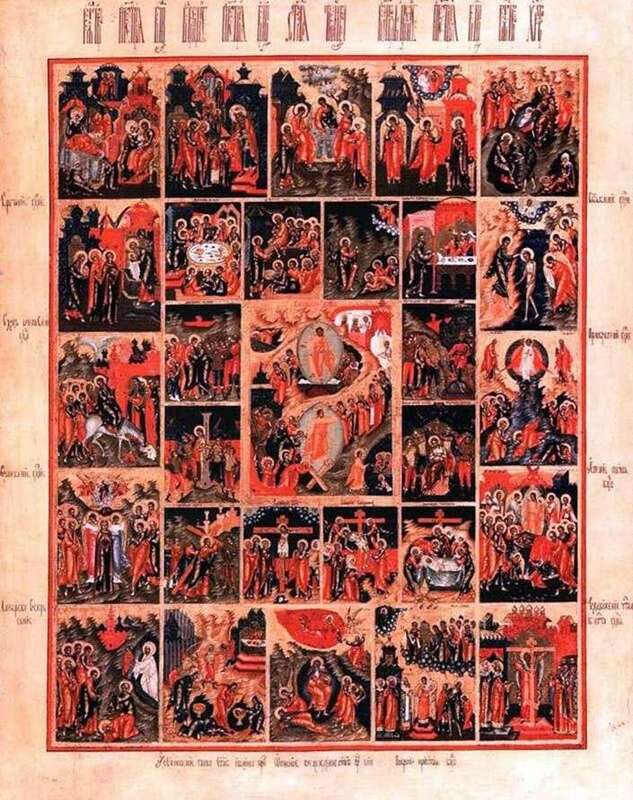 Around them – 16 more stamps with the image of the twelve holidays, from the Nativity of the Virgin to the Exaltation of the Cross, and also the Trinity of the Old Testament, the Beheading of John the Baptist, the Fiery Ascension of the Prophet Elijah and the Protection. The icon is a highly professional piece of Palekh painting of the mid-19th century. Description and meaning of the painting Resurrection of Christ.